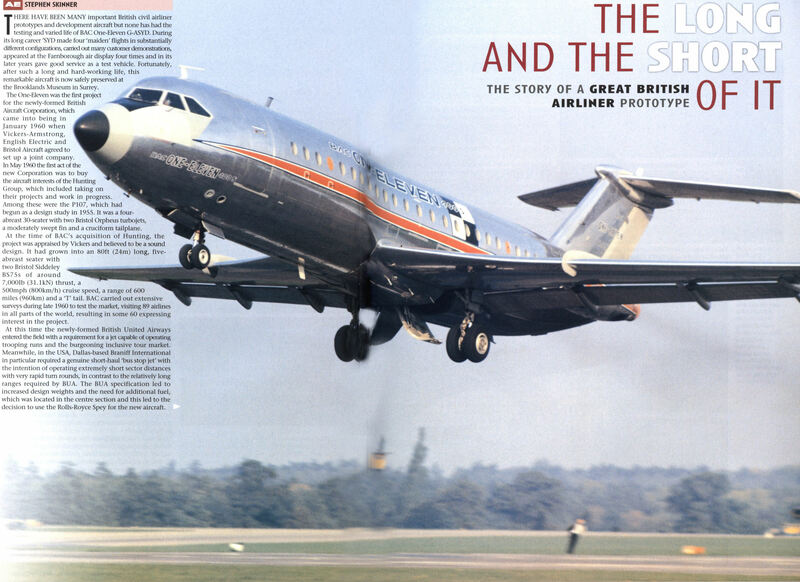 Dynamic shot of 'SYD taking off from Wisley with BAC One-Eleven 400S titles. At Iruma in Japan in 1976 for demonstration tour of Japan in 1976. JMSDF Lockheed-Kawasaki P-2J and Kawasaki-Vertol 107-IIs behind. After an eventful life, 'SYD's last landing - a really short one! - at Brooklands on July 14, 1994. 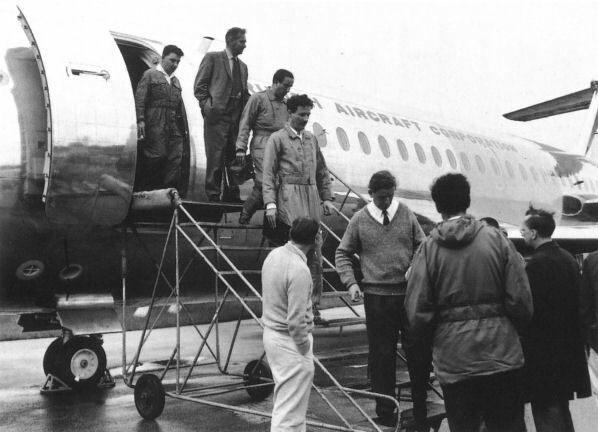 The crew disembarking after 'SYD's first flight at Hurn, July 13, 1965. Stretching in progress at Hurn - being cut into three and extended to become the 500 series prototype. 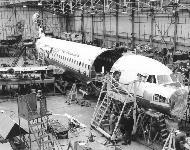 The forward part of the fuselage has already been opened up and moved forward while the section aft of the wing awaits a similar process. Before 'downsizing' as the -475 prototype, 'SYD carried out gravel runway trials at Wisley as a suitably-protected -500 prototype. 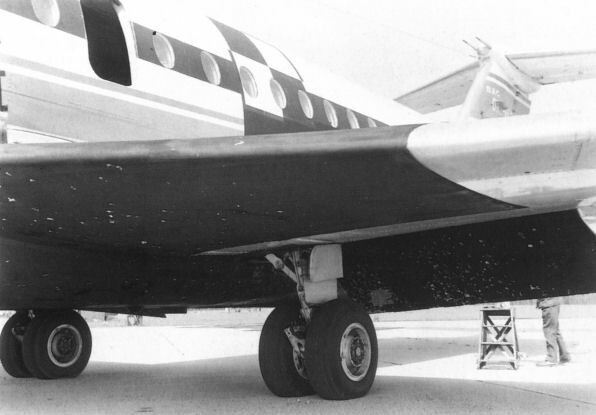 Note the cameras fitted below the nose and on the top of the wing. Close-up showing the results of the gravel runway tests. 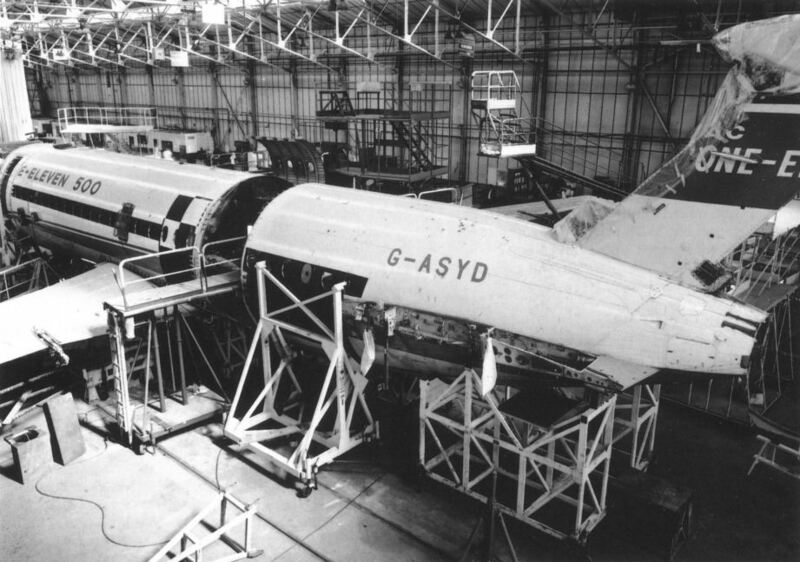 G-ASYD being 'shrunk' at Hurn to become the -475 prototype, with the two plugs fitted when it was lenghtened to a -500 already removed, though the aft fuselage has not yet been joined up. 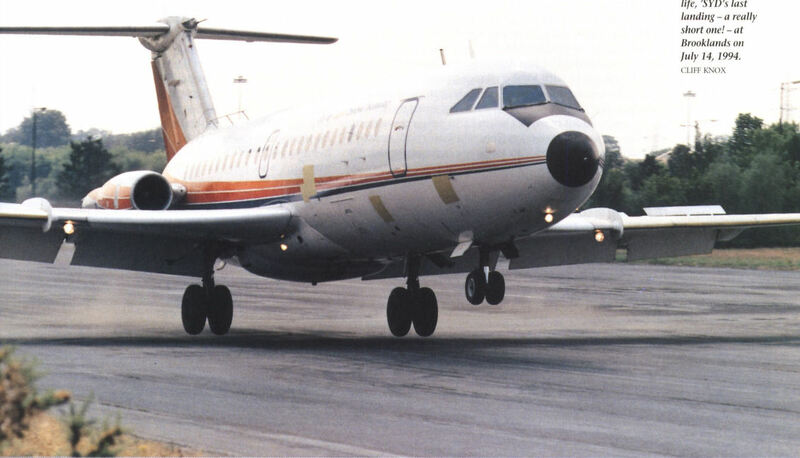 In May-June 1971 G-ASYD flew a series of trials on a specially prepared rough runway at Waterbeach which resulted in certification for the -475 for operation from unmade airstrips. Now a -500, 'SYD at the Wisley in September 1968 painted on the port side in the new BUA colour scheme for a publicity film. The other side remained in the BAC house livery. The anti-stall parachute fitting on the One-Eleven was large and fitted far back in order to provide a sufficient nose-down pitching moment and so that it would not become entangled in the tail. Right picture shows a deployment test.